The kindergarten teacher is from Springfield Elementary School. Sideshow Bob held back Bart, sending him to Kindergarten, after becoming Mayor of Springfield in a rigged election. Principal Seymour Skinner sent Bart to kindergarten and she taught him. 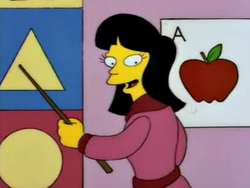 She is different from the Kindergarten teacher from the episode "Lisa's Sax" that took place five year earlier.